For fighter info, see Zero Suit Samus (SSBB), Zero Suit Samus (SSB4), and Zero Suit Samus (SSBU). This article is about the character Zero Suit Samus. For other pages with the name Zero, see Zero (disambiguation). Official artwork of Zero Suit Samus in Metroid: Other M.
Zero Suit Samus (ゼロスーツサムス, Zero Suit Samus), often abbreviated to ZSS or 0SS and colloquially referred to as Zamus, is Samus Aran while sporting her Zero Suit, rather than her Power Suit. As the Power Suit completely obscures Samus' face and body in most cases, the Zero Suit is typically used in games to show her features, either as a narrative element or as a reward for the player. The suit's name is a reference to Metroid: Zero Mission, which was the game it debuted in. As demonstrated via her alternate costumes in Super Smash Bros. 4, the identifier "Zero Suit Samus" also loosely refers to unarmored versions of Samus in general, a concept that existed since the original Metroid. 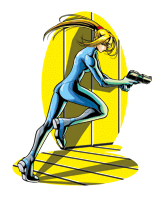 Official artwork of Zero Suit Samus in Metroid: Zero Mission, which marked the debut of her Zero Suit. While Samus has been shown without her Power Suit since the original Metroid, usually as part of an ending sequence, the Zero Suit first appeared in Metroid: Zero Mission, a remake of the original Metroid for Game Boy Advance. The original Metroid allowed Samus to be playable in a leotard using the well-known "JUSTIN BAILEY" cheat code; Zero Mission expanded on this by incorporating a playable, suitless Samus into the game's narrative for the first time, granting her a unique style of stealth-based gameplay. Ever since Zero Mission, Samus has appeared in her Zero Suit in every Metroid game except Metroid Prime Pinball and Metroid Prime: Federation Force, although the latter features a Zero Suit-inspired paint job for the playable Federation mechs unlocked via amiibo. The Zero Suit covers Samus completely from neck-to-toe in a cyan, skin-tight bodysuit with magenta Chozo sigils on her back, left breast, and the back of her hands. While wearing it, Samus wears her hair in a ponytail, although she is occasionally seen with different hairstyles in different outfits (prior to the Zero Suit's debut, Samus would be more often seen with her hair loose). Although Samus' eye and hair color varied widely across early games, most current depictions consistently give her blonde hair and blue to turquoise eyes. Despite this, Samus' "Zero Suit" character design has varied in nearly every appearance. Initial appearances would depict Samus with a high ponytail with a red hair tie, long sidetails, and lean musculature. Metroid Prime Hunters featured a heavy redesign for the Zero Suit that was not used in subsequent games, with a more simplistic, gloveless bodysuit and a different hairstyle for Samus. Metroid: Other M featured another drastic redesign by changing Samus' eye color (now a more greenish hue), her general hairstyle (a lower ponytail and much smaller sidetails), her general build (now short and slim as opposed to lean and muscular), and the Zero Suit itself (which now has a more segmented appearance and is equipped with wedged heels). This general design was carried over to Metroid: Samus Returns, but with a few minor changes, most notably by giving Samus a blue hair tie and a more athletic body type akin to her Super Metroid appearance; an unused design for the game depicts her with an altered Zero Suit pattern, but she retains her Other M paneling in-game. Within Metroid canon, Samus boasts superhuman athleticism even without her Power Suit, thanks to the Chozo infusing their DNA within her and training her in combat during her childhood. While she is also much more adaptive to alien environments than a normal human thanks to her Chozo DNA, she is still extremely vulnerable without her Power Suit, and thus must rely on stealth and her Paralyzer instead of direct combat to achieve her objectives. However, much like her fellow bounty hunter Captain Falcon, Zero Suit Samus is depicted in the Super Smash Bros. series with a varied and highly physical martial arts fighting style that compliments her superhuman athleticism. In addition, her Paralyzer is equipped with Super Smash Bros.-specific design elements that grant it offensive potential. Ridley's reveal trailer in Super Smash Bros. Ultimate goes as far as to depict the Zero Suit as an alternate combat mode that Samus willingly uses against Ridley, in contrast to to its canonical depiction. Zero Suit Samus debuted in Metroid: Zero Mission in a playable endgame level. After defeating Mother Brain, Samus escapes the Space Pirates' base on Zebes and deactivates her Power Suit prior to piloting her Gunship. However, Space Pirate ships shoot her down back onto Zebes' surface, destroying her Gunship and leaving her unable to activate her Power Suit. With the Zero Suit and her Paralyzer as her only methods of self-defense, Samus infiltrates the nearby Space Pirate Mother Ship in order to steal one of the Space Pirates' ships and escape Zebes. After stealthily navigating through the Mother Ship and stumbling upon the ruins of Chozodia, an ancient Chozo city, Samus undergoes a test left behind by the Chozo. Upon successfully completing the test, she is granted an advanced Power Suit that not only fully restores her previously lost abilities, but also grants her access to three upgrades that were incompatible with her previous Power Suit. Samus, now fully reequipped and upgraded, proceeds to escape Zebes via a Space Pirate ship after destroying Mecha Ridley and the Mother Ship. Samus also appears in her Zero Suit in a number of scenes in Other M. In the beginning of the game, she activates her Power Suit by pressing the Chozo sigil on her breast. Other M is the second time in the series where Samus is playable in her Zero Suit, but like in Zero Mission, this only occurs near the end of the game. In Other M's case, Zero Suit Samus becomes playable during the Bottle Ship's self-destruct sequence, and she once again has the Paralyzer as her only method of self-defense. Other M demonstrates that unlike the Zero Suit, the Power Suit will deactivate when Samus is unable to maintain a proper level of concentration, such as when she suffered a post-traumatic stress-induced panic attack upon encountering Ridley in the Pyrosphere, or after she dies. In other Metroid games, Samus' Zero Suit is mostly relegated to brief, non-playable appearances, usually as part of an ending sequence. Samus appears in her Zero Suit very briefly during ending sequences for Metroid Prime 2: Echoes and Metroid Prime 3: Corruption. In Corruption, Samus is shown briefly in her Zero Suit during the opening scene before she activates the Varia Suit while inside her ship. In both of these instances she deactivates her Varia Suit before or while entering her ship. She also wears the Zero Suit in the ending of Metroid Prime Hunters. Samus reappears in her Zero Suit in Metroid: Samus Returns for the Nintendo 3DS, where her Power Suit dissipates when she dies in-game - which is nearly identical to her death sequence in Super Metroid. In Metroid tradition, a more detailed view of her Zero Suit can be seen if the game's "best" ending is attained. While she is seen with her Other M Paralyzer, it is not used in-game. Higher difficulties replace the Zero Suit with a modernized "Justin Bailey" outfit (complete with green hair) or Samus' sportswear from the ending of Metroid Fusion. Aside from the Zero Suit itself, Samus has been shown in other types of clothing when outside of her Power Suit, with the most typical attires being revealing sportswear. Two such attires, which are seen in certain endings for Zero Mission and Metroid Fusion, appear as alternate costumes for Zero Suit Samus in SSB4. Suitless Samus in Super Smash Bros.
A reflection of Samus in her helmet can be seen in her congratulations screen. Also, when Samus is shot by a Ray Gun or hit by one of Pikachu's electric attacks, a faint outline of a female polygon can be seen, representing her actual body. While Zero Suit Samus does not appear, a special trophy called "Samus Unmasked" shows Samus with her helmet in her hand. Multiple events in Japan allowed players to obtain the trophies, but no such events occurred elsewhere. The NTSC and PAL versions still have the trophies in their respective data, however, and the trophy can be obtained via Action Replay. It's said that the orphaned Samus Aran was raised by the few survivors of the Chozo race. They armed her with a Power Suit and taught her the ways of advanced combat; even burdened with her heavy suit, Samus is as graceful as a butterfly. In the Metroid series, it was standard that Samus would remove her helmet and armor if you cleared the game fast enough. Zero Suit Samus as she appears in Brawl. Zero Suit Samus is a newcomer in Super Smash Bros. Brawl, being playable by either holding the Shield button while selecting Samus on the character select, using Samus' Up and Down Taunts in quick succession, or using Samus' Final Smash. Her design is based on her appearance in Metroid Prime 3: Corruption, albeit with slight modifications. Her playstyle has been described by many as being similar to Sheik's, in that she possesses many quick and acrobatic moves (in reference to her superhuman athleticism displayed in Metroid: Zero Mission) and is able transform from another character. Zero Suit Samus is equipped with the Paralyzer she wielded in Zero Mission, which grants her the ability to fire paralyzing blasts. However, it can also be re-configured into a Plasma Whip, which is a feature original to Brawl. Like her Power Suit's Grapple Beam, Plasma Whip also functions as a tether recovery. Thanks to her outstanding mobility, fast attack speed, excellent air game, Power Suit Pieces and the benefits granted by her Paralyzer, Zero Suit Samus is currently ranked 9th out of 38 on the tier list, placing her in the B tier. Zero Suit Samus' trophy in Brawl. Zero Suit Samus as she appears in Super Smash Bros. 4. 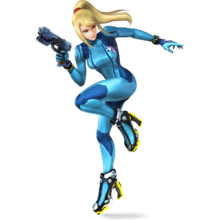 Zero Suit Samus returns as a playable character in Super Smash Bros. 4, albeit as a standalone character instead of being connected to her Power Suit. Like her Power Suit, the Zero Suit sports a marginally updated version of its design from Metroid: Other M, although it is now accompanied by a matching pair of Jet Boots and metal bracelets. The Jet Boots have changed her mobility and moveset in certain ways, whereas the bracelets are merely aesthetic. Samus' physical features are now a combination of her appearances in Other M and previous games including Zero Mission and Brawl. This results in a composite design original to the Smash series, befitting the fact that most of Zero Suit Samus' moveset was also created for Smash. Zero Suit Samus retains many of her strengths from Brawl. This includes a very impressive air game, thanks to her neutral aerial being useful at setting up attacks, her back aerial being reliable for KOing, and her up aerial being excellent at juggling and capable of KOing. Her excellent mobility and Paralyzer's utility grant her a particularly powerful punishment game and supplement her strong combo game, the latter of which is capable of quickly dealing large amounts of damage and even earning early KOs. However, unlike in Brawl, her KO potential has been improved, most notably thanks to her new forward smash and her new up special, Boost Kick. Despite all of these positives, Zero Suit Samus still suffers from a weak ground game, largely due to her grab game being laggy to the point of leaving her highly vulnerable to being punished if her grabs whiff. As she is still a lightweight, she is also susceptible to being KO'd early. However, Zero Suit Samus' strengths are agreed to largely outweigh her weaknesses, even in spite of her retaining her nerfs from Brawl and gaining new ones from game updates, which has been reflected in her achieving very strong tournament representation and results. Due to her benefits and competitive success, Zero Suit Samus is currently ranked 6th out of 55 on the tier list, placing her in the A tier. While this placement is only a slight improvement from her placement in Brawl, it nevertheless results in her being assessed as a top-tier character instead of as a high-tier character as in Brawl. Samus is far from helpless when her Power Suit is deactivated. Sure, she loses a lot of the moves and weapons she had access to before, but her Jet Boots pick up the slack! She also has the Paralyzer, a versatile weapon that can shock her rivals or change into a Plasma Whip to grab edges and enemies. Without her Power Suit, Samus Aran may not have her usual strength, specials moves or over-powered arm cannon, but her Jet Boots definitely kick things up a notch in their own way. The Paralyzer, her gun, does just what you'd expect it to, but it can also turn into a whip for attacking and grabbing onto edges while falling. Zero Suit Samus's up special Boost Kick involves a series of fast kicks that end with a swift, sideways-launching one. A perfectly executed attack will hit eight times! Her down special Flip Jump can bury a grounded fighter in the dirt. She can kick midflip by pressing the special button. Zero Suit Samus's Boost Kick up special finishes with a swift sideways kick. If you start the move close to an opponent, you can hit them up to eight times and launch them sideways! Her main down special, Flip Jump, buries opponents if you land on them at the end of it. Alternatively, press the button again mid-flip for a drop kick. Zero Suit Samus in Super Smash Bros. Ultimate. Zero Suit Samus reappears as a standalone playable character. She largely keeps her design from Super Smash Bros. 4, but with more detailed textures, a lighter hue, green eyes, and increased musculature, adding influence from her in-game design in Metroid: Samus Returns. She has been given a new Final Smash during which she dons her Varia Suit and fires a laser from the top of her gunship. Unlike in Brawl and Smash 4, she is an unlockable character rather than a starter character, and can be unlocked early on as the second character in Fox's Classic Mode character unlock tree. Zero Suit Samus is the only character in the entire Super Smash Bros. series to possess two tethers. She possesses two tethers in both Brawl and Smash 4, interestingly, in two different ways: her side special and up special in Brawl, and her side special and grab aerial in Smash 4 and Ultimate. Zero Suit Samus and Jigglypuff are the only characters in the Super Smash Bros. series to receive new special moves that render them helpless in subsequent installments, despite having debuted in the series without any. 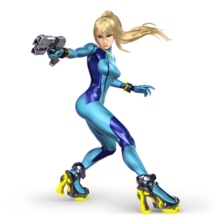 In Zero Suit Samus' case, she received Boost Kick as her up special in Super Smash Bros. 4, which renders her helpless after usage unlike Plasma Wire, her up special in Super Smash Bros. Brawl. Zero Suit Samus is one of four characters to have appeared since Brawl to have a different Final Smash across every installment; the other three are Pit, King Dedede, and R.O.B.. Zero Suit Samus is the first playable character in the Metroid series to have debuted in the 21st century. Most non-English or Japanese translations of the Smash games use alternate descriptors for Zero Suit Samus, such as "suitless/unarmored Samus" or "Zero Samus", thus leaving the Zero Suit effectively unnamed. ↑ Ultimate Nintendo FAQ - May 2002. N-Sider. Retrieved on 2007-03-23. ↑ Credits for Metroid. MobyGames. This page was last edited on April 10, 2019, at 22:30.